Being without your computer can be a difficult thing to deal with, whether you're using it for work, pleasure, or homework. Here at Computer Surplus Outlet we understand this and offer fast and professional expert repair for any type of system. Please visit our Repairs Page for more information on prices and services offered. Welcome to Computer Surplus Outlet of Ohio. We are the Greater Cleveland area's premier outlet for new, used and refurbished computers, peripherals, and parts. We have been providing exceptional computer values and services since 1997. Computer Surplus Outlet is always looking for the best products at the best prices for it's customers. 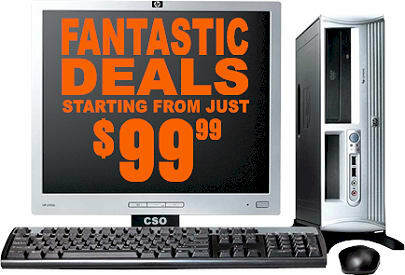 Visit us right now to view our barebones systems that start at only $99.99! These are complete systems and are perfect for school work, general web browsing and as basic upgrade kits. Getting a new computer for any reason is as easy as picking up the phone and giving Computer Surplus a call! Computer Surplus Outlet has the best deals on all of your computer needs. When you need a specific part to get your system running perfectly you can Call Us and we'll find it for you. Please check our Current Specials and come visit us any time! ►Information on this page includes Computer Surplus Outlet, computers, deals, super, greater cleveland, save, refurbished, new, used, peripherals, parts, and computer systems. Questions or problems regarding this website should be directed to Webmaster@ComputerSurplusOhio.com. ComputerSurplusOhio.com is solely owned by Computer Surplus Outlet, Parma, Ohio. Computer Surplus Outlet respects your right to privacy.